To mark the start of our new podcast mini-series on record shops, Finn Johannsen of Hard Wax Records Berlin chats to Josh about his place of work, the state of the vinyl industry, and of course his excellent newly recorded Louche Podcast. So Finn, this marks the first of a new mini series of Louche podcasts, focusing on dudes like yourself who work in record shops. Tell us, how long have you been working in Hard Wax and how did it come about? I’m working there since the end of 2010. It was basically coincidental. I realized that all the deadlines that come with working solely as a freelancer were not that compatible with my newborn daughter and I was vaguely looking for some additional steady work. I was a regular customer at Hard Wax and dropped some hints that I would be up for it if there was some vacancy. Then Achim (Prosumer) decided to quit working at Hard Wax and I got the job within just a few weeks. Your one of the shop’s house music specialists right? Do you take pleasure from discovering music to sell in store? I’m probably particularly knowledgeable with House and Disco. But then I’m over 40 now and buy club music as long as I can remember, thus I’m able to offer some good advice on almost anything we are selling. And this applies to anybody working at Hard Wax. We all know a lot about music, and all of us are eager to learn much more. And we like to provide our customers with what we know and love. You need the urge to do so by any means, else maintaining the high standards of the store would not be possible. If you lose the thrill of unpacking and checking the week’s news or delving into sounds you were not accustomed with before, you better reconsider. But I doubt that will happen too soon. There is always good music to discover, every day. Do you feel responsible for breaking any producers into the scene? Has anyone seriously blown up after Hard Wax stocked their music? I certainly helped some producers before I started working at Hard Wax, particularly as a journalist. But I’m modest enough to not drop names. They know. As an institution, Hard Wax surely plays a role. A record stocked and recommended at Hard Wax is still a welcomed quality marker, and it takes some responsibility and care to maintain that status and also not to abuse it. There are quite a few labels and producers affiliated with the store who left their mark after the heyday of the classic Hard Wax labels, which is great. The same goes for labels and producers we discovered or supported over the years. If you follow our tracks on a regularly basis, you should be aware of who I am talking about. But any store in our position should do that the best they can, to keep things going. You must have an absolutely massive vinyl collection at home, but whats the deal- do you get to take home whatever records you want? I have a few thousand records but I decided to keep it at a certain level and thus my collection is now more or less like a revolving door. Whenever I buy some records, I also sell some. I have the privilege of being handed vinyl promos and of securing records that sell out quickly, but it is not that anything that might interest me automatically gets put into my shelf. When I’m not in the shop, I check out the website like any other customer, and I also miss out on releases if I do not have the time to do so. But if you are surrounded by so many new releases every week you also learn to distinguish what kind of records you really need. I only buy records on the terms of my musical preferences, and nothing else. What do make of the vinyl game currently, or after the last few years? Do you think there has been a noticeable resurgence in people buying wax recently? Vinyl sales are still going very strong at Hard Wax, but sadly that is not necessarily a reality for other smaller shops, who are often struggling to stay open or have to close down eventually. There will always be music collectors who prefer the convenience aspects of digital releases, and music collectors who favour a haptic vinyl release. It is a fact that there still is a DJ and collectors vinyl market that labels and producers can cater for. And I do not blame anybody for preferring a certain format, as long as they make good use of it. Hard Wax is very determined to sell vinyl as long as possible, that is for sure. Do you produce Finn? Or ever considered getting into it? No, I don’t. 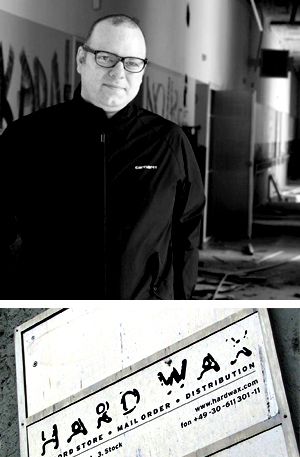 Being a father, working at Hard Wax, co-running the Macro label with Stefan Goldmann, playing out in clubs, writing. Consider me well busy. Who knows, someday a ridiculously limited stamped white label hyped and killed for by people of all nations could be my doing, but I probably won’t tell. As for now, I have nothing to tell. That is the absolute truth. Can you tell us a little bit about the mix you recorded for us please? It’s basically a run through records I took home from the shop and played out regularly at the moment I recorded the mix, two months ago. A mixture of artists and producers I think are well worth supporting and who have their own distinctive signature sound, and some tunes that just stood out for me. It also touches most characteristics I look for when buying records. If you would have heard me playing out at that time, this is what it probably would have sounded like. I rarely ever play the same set twice, but some of these are still in good use. Which speaks for the records included. And lastly, what are your favourite record shops to go digging through? Since I started working at Hard Wax, I have considerably less time for digging than before, but I try to spare some if possible. But then it is mostly shops with second hand vinyl, or flea markets. In Berlin, I like shops like Audio-In, O-Ton, Power Park, Cover Music and some more. I also love checking out shops I haven’t been to before, which luckily enough is still happening. Shops in other cities that I enjoyed the most recently were ZeroZero in Zürich, and A-Musik in Cologne. My favourite shop ever for digging is a store called Plattenkiste, in my hometown Kiel. The sheer amount of rare and good stuff I bought there since the 80’s is just incredible. The owner is not really interested in music, and every record costs 1 €, regardless of format. You have to dig deep, but you will find. After dropping some serious euros on records whilst recently in Berlin, on the flight home we had a brain wave. In a musically inspiring city like the German capital, with all these top DJs buying tunes for their gigs every week, who are the behind the scenes guys who stock the shelves? The guys whose taste so influences our scene. This podcast starts a new mini collection within the Louche Podcast series, a selection of mixes created by dudes who work in record shops around the globe. First up, Hard Wax Berlin’s House and Disco specialist Finn Johannsen. Working there since 2010, but cutting his teeth before then as a DJ, label owner and music journalist, Finn’s knowledge and taste in the music we love is second to none. Buying in tunes from distributors which are in turn bought by music enthusiasts, DJs or whoever else; Finn’s selections help shape the city’s musical climate. This mix, as you would expect, is sheer class; rolling from house to techno to a bit of proper old electro with consummate ease. Make sure you check Finn’s new Louche Interview to support this podcast to learn more about the guy. Finn Johannsen and the others record shop buyers out there, we salute you!